Kings Dominion deals are starting to flow! Look below at "Single-Day Ticket Deals" to learn how to get tickets for as little as $34.99 including parking. First, the bad news about the park. Over the last several years, the park has jacked up their single-day ticket fee. That means that a family of four could spend over $80 more than several years ago just to get in the gate. Amusement parks are great, but jeez...who needs to spend full price? That's why my discount ticket info is so crucial for you. First, you'll have to decide if you want a single-day ticket or a season pass. I have discount secrets for both. Kings Dominion offers a variety of season passes which are actually pretty good deals, especially if you buy four or more tickets. Here's how to get discounts! You do NOT have to pay full price for tickets, and you can do way better than even the regular rates. Click the "single-day discount ticket" link below for coupons and other ways to save $20-$30 per ticket (and even get free parking)! - For single-day discount ticket secrets (including current promo codes and military discounts), click here. - For season pass discounts, click here. Hours, Park Events, Meal Deals, & Dinosaurs Alive! Want to know what concerts and special events are happening at the park, like "Nights of Fire," KingsFest, Joyfest, and Halloween Haunt? Go to my Kings Dominion Events page. Note that last year, for the first time ever, the park offered Winterfest, a holiday-themed winter event similar to Busch Gardens Christmas Town. For the operating schedule and hours, go to my Hours & Operating Schedule page. To help you save on food, Kings Dominion offers Meal Deals. One thing they offer is a Souvenir Bottle All-Season deal, which costs $29.99 and gives you free refills all season long. Yes, it's a lot more expensive than the old deal, which was $11 per bottle. However, the old deal required you pay $1 for refills, so if you're a big soda drinker (or if you want to share one with the whole family) and you come multiple times, this may still be worth your while. The meal plan can be redeemed at many places in the park and can be used anytime during the day for a single-day visit. To get my latest updates, subscribe to my Virginia Beach Blog. No word yet on whether they will offer it again this season, but if they do, here's what it may be like: Have breakfast with your favorite Snoopy character for about $16 for adults or $11 for juniors/seniors. The meal includes scrambled eggs, sausage and bacon, french toast sticks, milk, coffee, etc., and is available 10:30 am to noon. You can order this and meal deals ahead of their at www.kingsdominion.com. Kids ages 1-10 who visit the Kings Dominion on their birthday can receive a special birthday package at no extra charge if you fill out a Snoopy's Birthday Buddy Club form at least one day before your visit. 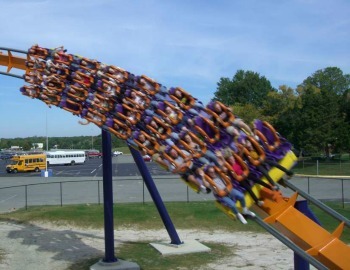 Bypass the lines on 13 top rides (only exclusions are Intimidator and Volcano). There's no limit on the number of times you can bypass the lines in a day. Passes are available for as little as $50 each day. Bypass the lines on ALL rides (including Intimidator and Volcano). There's no limit on the number of times you can bypass the lines in a day. The park site says you can buy them for as little as $65 per day. For either pass, visit the park website. Kings Dominion is located off I-95, 20 miles north of Richmond and 75 miles south of Washington, D.C. The park opens April 4th, and is open daily during summer; weekends in spring and fall. For a map of the park itself, plus directions, go to Kings Dominion. Want more discount tickets & travel tips?